I advise purchasing this bag we were very happy with the finished product and the customer service we received. Multi-purpose bag and its eco-friendly. My customers use it in a million ways. The handles have extra stitching on the inside of the bag and the outside in the shape of an "X". There is also an extra lateral double band stitch that wraps around the top of the bag tying the handles in. We received samples from a couple different recycled reusable bag manufacturers prior to placing our bag order. Custom Earth promos had the best made bag and we felt it would last the longest amount of time for our customers. I heart these guys, always a good time working with them! Super lightweight and convenient, most of our customers just leave the bags in there car the bags fold nice and can fit in that pocket behind each front seat. The bag comes with like a padded bottom insert that really helps with the rigidity and sturdiness of the bag. I am a dentist and wanted to give my patients a gift that would also advertise my company. We went with custom earth promos RB8 bag with our logo on it. It was a great idea and the patients are happy to receive. We handed these out to our students to welcome them back to the school year. All of the kids love them and use them for books and so many other items. We did a rush order on this bag and received the whole order in time for our event. Cute bags, you can customize your artwork however you'd like, Ours came out great. Great bag! Low maintenance and high quality! Love the fact that these recycled grocery bags look like brown paper bags. Cool concept. There is such a large printing area on these bags. There's no way anyone could miss our logo! The imprint area on this bag proudly displays my company's logo and the bag, as a whole, is of a great quality. Will order from Custom Earth Promos again! These bags are superior to any other competitor on the market. High quality materials yet easy to handle. Couldn't ask for anything else in a product! Light, reusable, easy to clean... The list could go on and on! We love this bags! They are easy to handle and our logo looks beautiful! This bag has a simple, classic style that we all love! These are phenomenal! They can carry our heaviest items and our customers love them! Matte laminated finish is washable and durable. I am going to reorder this bag once we sell out. We are a nonprofit who simply tries to promote sustainable green methods of living and conducting business. We have partnered with custom earth promos on several projects. They are always professional and we approve of there products from a eco-friendly standpoint. The sewing around the edges is done well and we did not have many issues with a very large order. I passed this reusable recycled bag out with a couple of my employees at a trade event show. The reactions we got from potential customers was awesome I am very happy with the way my recycled bags turned out. Green print looks great on the natural color, quality of the image is excellent also. Handles are perfect length to fit over your shoulder when shopping in the store. I found custom earth promos this way by shopping at my favorite clothing boutique who uses them. Nice bag, our custom logo looked really sharp on the recycled material. The customer service was wonderful. I would not choose to work with another company going forward. I work for a large bank in NY and we handed these bags out to customers and employees as a marketing promotional gesture. I now see them all the time all over the city. Our employees alone use them for so many different things on there commute to work and carrying lunch. It was a great marketing strategy and suggest the same to other businesses now. Great looking bags that have drastically helped us to go green. I liked the small tag at the bottom of the bag that reads "Reuse Me" with a small globe below the writing. It's a nice reminder that we are playing a role in saving the planet and not just spending money on something that is going to promote our company. Bag stands up on its own when the insert is at the bottom. This makes packaging groceries very easy, our cashiers and customers love this bag. Sturdy bags that help us to maintain an earth-friendly mentality. Very convenient bags. We were able to stay well within our budget, and provide our customers with a lovely eco-friendly product. Cool reusable bag! I will be ordering hundreds more for sure! Being that these eco-friendly bags resemble brown paper bags they still within the realm of tradition. We appreciate this and like that we are helping an earth-friendly cause. Perfect size for groceries, we ordered thousands and offer these to our customers as an alternative to the plastic bag. Most of the order is gone already and it only has been a couple of months. I think once customers see other customers using them and how much easier it is then they buy them and don't look back once they start using recycled reusable bags. We are a very "green" company and this is our favorite reusable bag to use. Its made from recycled materials and is a ploy on the harmful paper and plastic bags. It was the perfect reusable bag for our company because we wanted to make sure the bag said "WE ARE GREEN!" Good sized bag and strong handles for carrying lots of groceries. We just placed our third order for the RB8 we did 3 different designs and the first 2 came out great we are looking forward to the next one. What’s the most effective way to use eco-friendly promotional giveaways to attract attention to your company or brand? Consider Custom Recycled Grocery Brown Bags from Custom Earth Promos. Crafted from robust, high-quality non-woven polypropylene, we can imprint these bags with your lively, colorful, visually appealing graphics/logo/message and attract all the attention you want, to promote meaningful brand recognition. Made to look like an old-school paper bag, the Custom Recycled Grocery Brown Bag from Custom Earth Promos is designed in a neat, simple and elegant style. Constructed using high-quality recycled materials, these durable bags are the perfect canvas for your brand’s colorful printed graphics since they hold color so well. Using an exclusive design, each tote is cut from a large piece of kraft paper that is laminated on non-woven polypropylene, making each recycled bag the perfect recycled material combination. 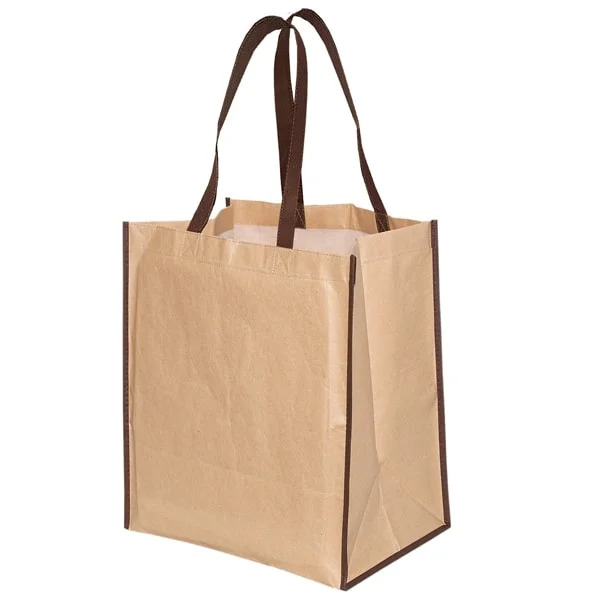 With our Custom Recycled Grocery Brown Bags, you are giving every customer a completely specialized bag made with durable materials and displaying superior visual graphics. Is there any better way to market your brand and make your customers feel special at the same time? These brown bags from Custom Earth Promos are built to last and do a great job of displaying dazzling colors. With a matte finish and stitched to perfection from one continuous piece of reusable laminated material, each bag is recycled and can be easily wiped clean for repeated use, making them low-maintenance and high-value for the money. Large drop handles make for easy carrying, and precise, reinforced stitching ensures months of use for your customers. With its open main compartment, the Custom Recycled Grocery Brown Bag is also fitted with a large 8.5" gusset for added strength and support. Each visit to the grocery becomes an eco-friendly affair as you demonstrate your opposition to using plastic, plus now you can carry heavy items without worrying about your bag ripping open. Distributing eco-friendly and recycled bags will not only earn you recognition among customers but also encourage them to adopt green practices. Imprinted with colorful food-related themes, the Custom Recycled Grocery Brown Bag is perfect for the supermarket. And it’s the perfect product to promote your brand with a stylish image and a simple, visually appealing logo across an eye-catching eco-friendly bag. This is just the promotional product you’ve been looking for. Plus it’s affordable, especially when you order in bulk, making for an exceptionally cost effective marketing tool, even for smaller businesses with limited budgets. Practice what you preach, and your customer base will follow. Distribute eco-friendly bags and spread the word about the green movement!